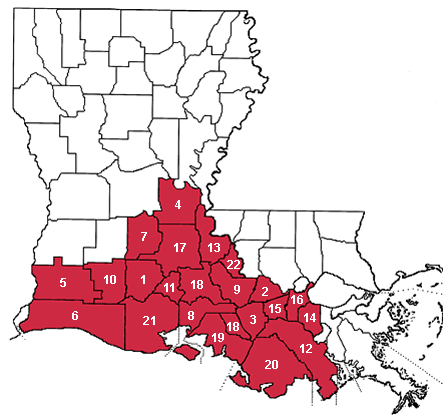 In 1971, the Louisiana legislature adopted House Concurrent Resolution 496, which officially dubbed as Acadiana a twenty-two parish region of southern Louisiana. The area's name recognizes the region's historic role as the area in which approximately 3,000 Acadian refugees sought sanctuary after a massive ethnic-cleansing operation in present-day Nova Scotia. The refugees' descendants are now called Cajuns, and the region is still home to the nation's largest concentration of Cajuns. Acadiana, however, is also home to the country's largest rural Creole population. Acadiana is the cradle of Cajun music, Zydeco, and Cajun cuisine. The region maintains perhaps America's highest culinary standards and boasts an exceptionally high concentration of excellent restaurants. For a guide to each parish's cultural resources, use the map below. For a guide to each parish's cultural and environmental resources, use the map below.